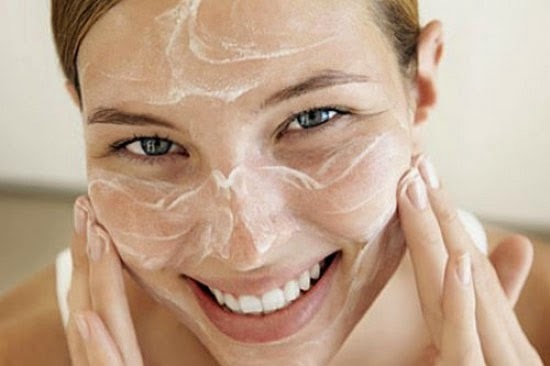 Dry skin is more prone to get skin wrinkles and fine lines as compared to oily or normal skin. That's why it really needs some extra care and nourishment to prevent premature fine lines, wrinkles and skin blemishes. Regular skin exfoliation along with moisturization is also essential to remove dead skin cells and to promote the growth of new and healthy skin cells. For skin exfoliation of dry skin, here we have a collection of best homemade natural skin scrubs specially for dry skin type. Let's have a look on them and go with the one that really suits your skin. Take 1 tablespoon of Dried orange peels and 1 table spoon of Dried Lemon Peels.Mix 2 table spoons of curd(yogurt). Blend them well and then gently apply on face and neck and massage in circular motion for 2-3 minutes.Leave this mixture for 5 to 10 minutes then rinse off. Take 1 tablespoon of Oatmeal Powder and mix with 2 tablespoons of yogurt and blend them well and apply this paste on your face and neck. After gentle massage leave for 5-10 minutes then rinse off with warm water to open pores then with cold water to close skin pores. Take 1 ripe mashed banana, 3 tablespoons granulated sugar and 1/4 teaspoon of olive or almond oil.Mix them well and apply on face and neck.Gently massage for 2-3 minutes.Sugar sloughs off dead skin cells and banana nourish dry skin and give you healthy glowing skin.After 10-15 minutes rinse off with warm then cold water. Mix coarsely ground almonds in honey. You can grind about 100gm of almond in a mixer grinder and store it in an air tight container.This way you can have your instant scrub ready. Add 1tablespoon of honey in 2 table spoons of ground almonds. Apply it on your face and neck then gently massage for 2-3 minutes and let it stay for 10 -15 minutes then rinse off with water. Mix 1 tablespoon of honey in 2 tablespoons of ground almonds. Now add some yogurt and few drops of lemon juice. Blend them well and apply on face and neck. After gentle massage of 2-3 minutes leave it for 10-15 minutes then rinse off with warm and cold water alternatively. This scrub is also good for sun tanned skin and help a lot to remove sun tan. Take 2 tablespoons of Olive oil,1 tablespoon of raw honey, 1/4 cup organic cane sugar.Mix them well and apply on face and neck. Massage for 2-3 minutes then leave this mixture for 10-15 minutes and rinse off with warm water. Take half Cup of White Cane Sugar, half cup of Avocado Oil,3 tablespoons of Aloe vera gel Or Vitamin E Oil. Mix them well and apply on face and neck.Gently scrub for 2-3 then leave this mixture for 10-15 minutes and rinse off with warm water. (i)First of all before applying any kind of scrub clean your face and neck with fresh water. (ii)Remove all cosmetics, creams, lotions even everything. For this purpose use a non abrasive and good quality beauty soap. After washing your face, pat your skin dry. (iii)It is much better to take a hot shower or a steam bath to clean and open up your pores. (iv)If you are allergic to some natural ingredients then avoid such scrubs which contain any of the ingredient which may create itching or allergic effects in your skin. (v)Never scrub on acne, burned, damaged, wounded or irritating skin. (vi)Before applying any scrub first take a small Patch Test on little area of your skin and wait for 10 to 15 minutes if it creates itching or allergic effect then immediately remove it and rinse off with cold water. (vii)Place a small amount of the scrub on your fingers then gently massage your face in circular motion.You can also put the face scrub on a cosmetic pad then gently rub the pad across the face but avoid harsh strokes.You do not have to be too hard on your face because your face simply needs a gentle massage and regular circulation motion. After using the scrub gently rinse off with lukewarm water then wash your face with cold water to close skin pores and gently pat dry your skin with soft towel. (viii)Finally apply a good moisturizer and massage slowly with circular movements on face and upward strokes on neck area. This will boost blood circulation resulting in a fairer and brighter complexion.